BENEATH HORIZONS: Australian Desert Landscape was my MFA exhibition that covered the floor of an urban gallery with 7 tonnes (2.5 billion grains) of red sand to bring the desert into the city, so that viewers could experience being out there in the emptiness, or the void. The walls showed my desert videos created during 4 camping expeditions in the wilds of the Australian Deserts. Including, 3 stop frame HD animations, 2 HD performance videos, 2 photo-collage HD videos and a soundtrack that encompassed and unified the exhibition @ Kudos Gallery, 6 Napier St, Paddington, NSW, Australia, 8-17th May, 2014. 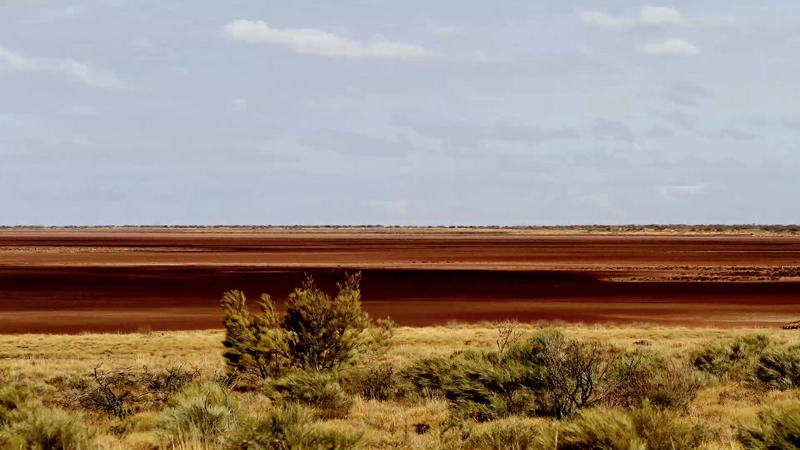 “My research focused on the ground beneath me to locate my presence as an observer at a particular time and place in the Australian desert landscape. 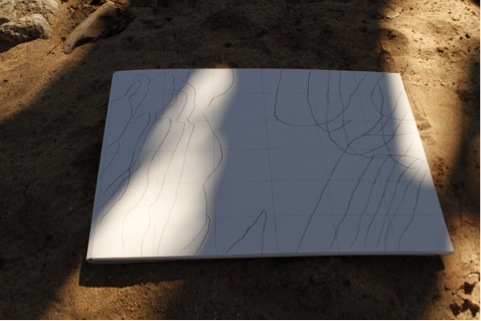 In some ways, I micro-mapped the time/space of a particular place, as I engaged daily with the forces of nature that continually transformed the desert floor of that place.” – Thesis, p.v. Red Desert Project A micro desert created by installing seven tonnes of red sand to cover the entire floor of an urban gallery, so participants could experience being ‘out there’ in the emptiness. Approx 2.5 billion grains of sand in the exhibition equalled the number of suns in our Milky Way Galaxy. Julia Featherstone, Gibson’s Compass 2010-14, Rig Road, Simpson Desert, SA. HD video still. Three-channel sound. (26:03″) looped. 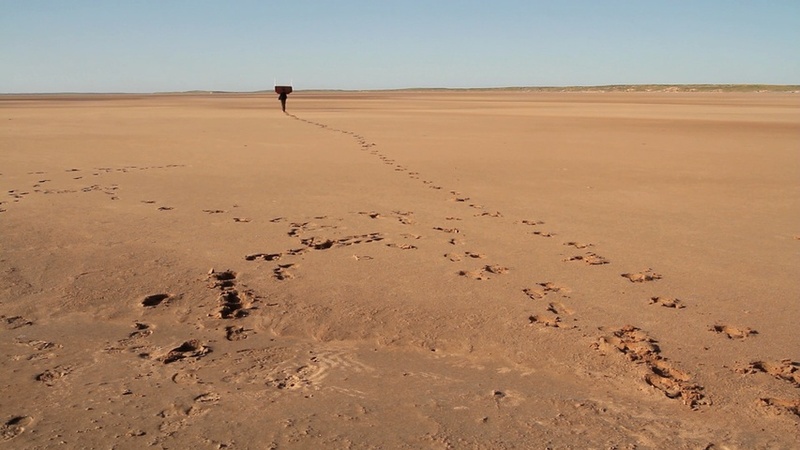 Gibson’s Compass: Performance video inspired by the disappearance of colonial explorer Alfred Gibson, when he ran out of water in the centre of Australia. After being bogged nine times in the Simpson Desert clay pans I strode out across the bog, seeking new horizons. In 1873, Gibson having run out of water, set out to return to the main camp, but became lost because he never learned how to use the compass he had borrowed. In my video, I carry a camp table over my head and, like the Gibson’s compass, the table became a useless object in helping me to find dry land. Moonlight Sonata: Photo-video explores the random and mysterious ‘Min Min Light’ phenomenon appearing near the road connecting Winton and Boulia in outback QLD, scaring observers. 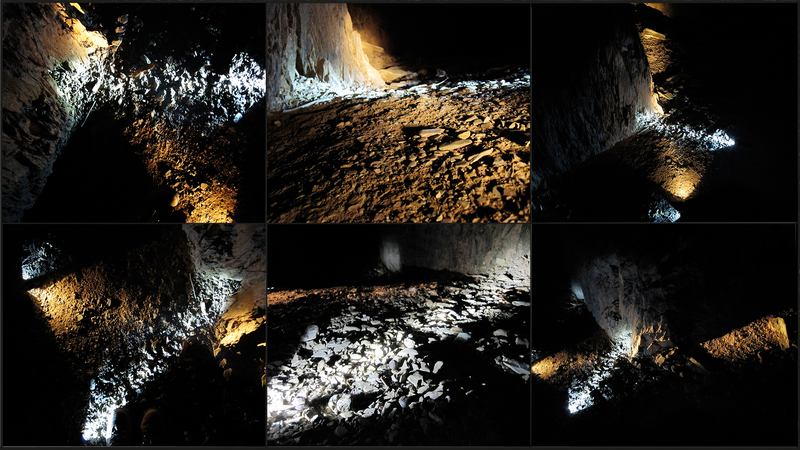 The desert landscape was painted with artificial lights under the full-moon to imagine eerie and ephemeral experiences when alone at night in the desert. Time-lapse video shows wild wind and rare rain swirling across Lake Disappointment, WA, on 9 July 2010. The lake is a large 330 square km clay pan. The night before, the strong winds blew my camp chair and gortex jacket into the fire, burning the fabric of the chair and melting the jacket. Local indigenous people avoid this place, believing cannibals live under the lake. A series of photo-grids that map three perspectives of the Australian desert landscape, at a particular time and place. 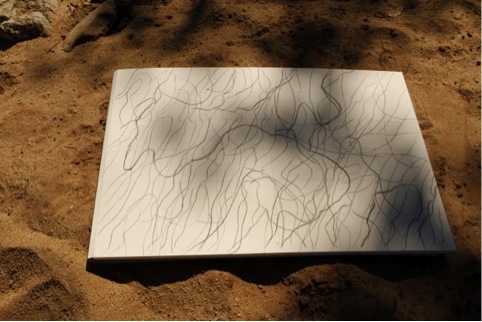 The work explores sand, plants and shadows found on the floor – beneath the horizon and the sky. The left frame is an aerial view showing the toes of my boots. The middle frame is a low view across the ground from the perspective of my boots. While the right frame is a wide angle view of the landscape, just below the horizon line, taken at my height. 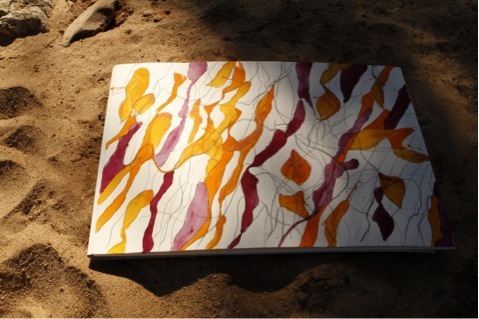 Stop frame drawing animation that is a metaphor for one of the oldest desert rivers in the world, the Finke River, where its expansive creek bed continually changes shape and water flow. Pencil lines chase fleeting and erratic shadows of a large, very old, red river gum that stood in the middle of the ancient creek bed, also capturing the eternal daily rotation of the sun towards the western horizon. Video and photographic series that critiques Renaissance linear perspective by bringing an alien ‘Renaissance’ object into the desert. The object is an umbrella bought in the markets in Florence, Italy, with photos of six iconic Renaissance buildings plastered around the rim – a perfect metaphor for Australia where we cling to the edge of the continent, rarely venturing into the emptiness of the centre. Julia Featherstone, Shadow of the Flesh 2010-14. Stop frame animation video still. Electronic soundtrack that encompassed the exhibition. ‘Before it can ever be a repose for the senses, landscape is the work of the mind. Its scenery is built up as much from strata of memory as from layers of rock’ (Schama, 1995). This work was inspired by the connections between mind, memory and landscape I grew up on the NSW coast listening to the wild classical music my mother had learned to play on the piano in outback Winton, QLD. Her music evokes an emotional response still, particularly the fast octave runs that create energetic excitement. This work is moody and evocative.